Sulh Ensemble’s artistic director, Jon Silpayamanant, plays a Thai Phin. The Phin is a long-necked lute from the Isan region (where Jon was born). 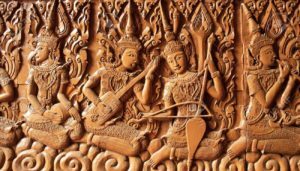 Used mostly in Laotian/Isan folk and pop music, the instrument also became popular in a regional genre of psychedelic folk-rock in the Isan region. The strings of the Phin are usually tuned E – A – E and fretted pentatonically. Sulh Ensemble is a group that plays intercultural music from the Silk Road, South and Southeast Asia, the Mediterranean, and new compositions for ethnic ensembles based in the Greater Louisville/Kentuckiana region. Through concerts, collaborations, and outreach with dancers, composers, and musicians the group is constantly exploring global music genres. Many of the musicians of Sulh are active as teachers, producers, advocates, and practitioners of the arts of many music and dance traditions from around the world.